Rembrandt Harmenszoon van Rijn (1606-69), Belshazzar's Feast (c 1635-8), oil on canvas, 167.6 x 209.2 cm, The National Gallery, London. Courtesy of the National Gallery, via Wikimedia Commons. The earliest painting used almost entirely earth pigments, with the significant addition of charcoal black. As trade developed around the Mediterranean, in particular, the range of colours provided by earths and powdered minerals expanded. During Classical times of the Greeks and Romans, trade became extensive, and brought a very wide range of naturally-occurring pigments. At some stage, artists appear to have learned that soluble dyes, particularly those derived from vegetables, although suitable for colouring textiles, did not have the same durability and lightfastness as most pigments, which consist of fine particles suspended in the binder. Classical technology also started to process some rocks so as to improve their use as pigments. As Europe went into the Dark Ages, earth pigments were available in a range of colours, from green and yellow, to red, brown, and almost black. Yellow ochre, the earth, was in general use, but is not a pure yellow colour. Lead-tin yellow does not appear to have been used as a pigment until 1300, after which it became popular. Lead antimonate yellow (Naples yellow) was known, but was not used significantly as a pigment until the middle of the seventeenth century, when it gradually replaced lead-tin yellow. Orpiment, yellow arsenic sulphide, was known in Classical times, but only saw intermittent use: Tintoretto used it extensively, but many other artists do not appear to have used it at all. Red lead, or minium (natural lead tetroxide), had been in use since about 50 BCE, but its low tinting strength resulted in it being more commonly used in combination with vermilion, rather than on its own. Vermilion, naturally-occurring cinnabar mainly produced at Almaden in Spain, and composed of mercuric sulphide, was a generally reliable brighter red than the earths, but was highly toxic, expensive, and prone to discolour over time; it was often adulterated with red lead. Realgar, red arsenic sulphide, appears to have been used infrequently and has only very seldom been identified in paintings. Madder, a plant-derived dye, was laked with alkalis, but the resulting colours were variable. Ultramarine blue, made from ground lapis lazuli, originated from mines in Badakshan, now in Afghanistan, and was brought overland via the Silk Road, the final leg being by sea into Europe, hence the name ‘over the sea’. It seems to have been used in Europe from about 1000 CE onwards, and had always commanded a high price. As a result, azurite blue was more commonly used, particularly in underpainting for a top layer of real ultramarine. Its price was lower because of good supplies from mines closer to hand in Hungary. A cooler blue than ultramarine, azurite is relatively stable, although in some paintings has turned green. Smalt, a glass mineral containing cobalt, became used as a blue pigment during the fifteenth century, but being transparent, particle size had to be relatively coarse, and even then its hiding power was low and its colour was dull relative to azurite or ultramarine; over time, it may become even duller grey-blue. Indigo, a very dark blue dye derived from plants, was ground with other materials and used with success in oil painting, but was more commonly used as a dye for fabrics. Green earth was widely used, particularly in the underpainting of flesh, but was too dull and low in hue for the accurate depiction of foliage. Verdigris, copper acetates, had been manufactured since Classical times, and were used for the most intense greens, but only developed its full green colour about a month after application. It also had a bad (and perhaps undeserved) reputation for chemical interaction with other paints, and subsequent colour change. Green copper resinates were used in glazes during the Renaissance, but fell out of favour because of their tendency to discolour over time. Malachite was also used as a bright green during the Renaissance. Durable greens were mixed from blue and yellow pigments, but were often quite dull. Lead white was manufactured during Classical times, and was the only white pigment used in oil paints until the nineteenth century, although it was sometimes adulterated with chalk. Curiously, although zinc white had been known and manufactured since Roman times, it was not used as a pigment until the end of the eighteenth century. Blacks were almost all derived from burning, and included carbon black and ivory black, the latter normally produced by burning animal bone. 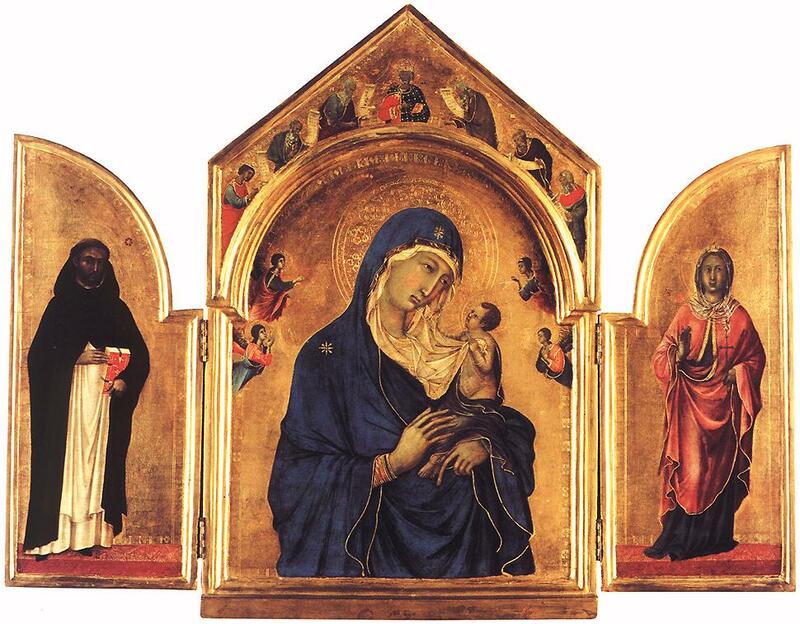 Duccio di Buoninsegna (1260–1318), Triptych (1300-5), tempera on wood, 61.5 x 78 cm, The National Gallery, London. Wikimedia Commons. Duccio’s Triptych (1300-5), was painted using egg tempera on wood. In the centre panel, the cloak worn by the Madonna uses ultramarine as the pigment. It has retained its distinctive deep warm blue for over 700 years, attesting to the quality of the pigment used. Palette of 16 colours extracted from The Wilton Diptych (c 1395-9). 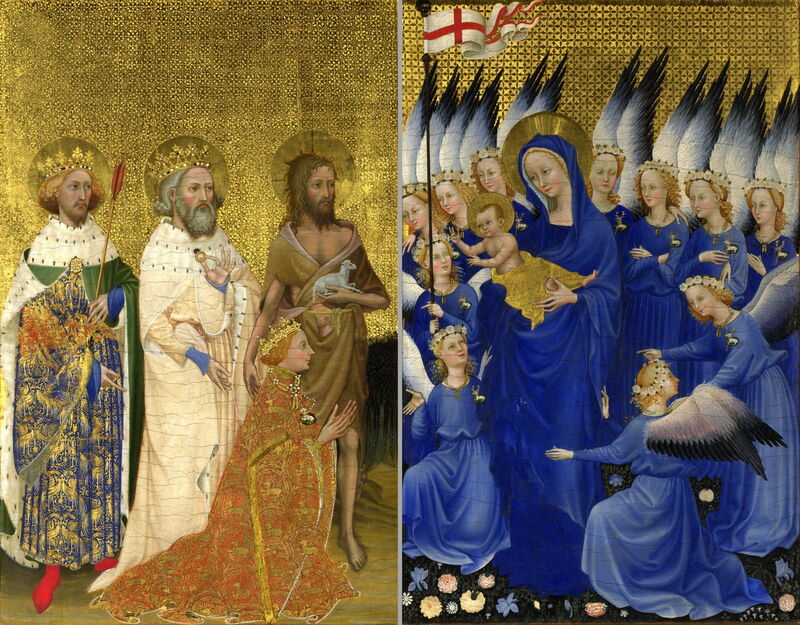 Another early and impressive use of ultramarine is in the Wilton Diptych (anonymous, c 1395-9), which is again painted with egg tempera on wood, and still in fine condition. All the blue seen here is believed to have been ultramarine, and Richard, the centre figure of the left panel, wears a robe painted in vermilion. Unfortunately the pinks, and the yellow used to make green for the grass, have also faded. Despite the limited range of pigments available, its extensive use of ultramarine has ensured that over 600 years later it retains an exquisite beauty. Dirk Bouts (c 1400-75), workshop of, The Virgin and Child with Saint Peter and Saint Paul (c 1460s), oil on oak, 68.8 x 51.6 cm, The National Gallery, London. Courtesy of the National Gallery. 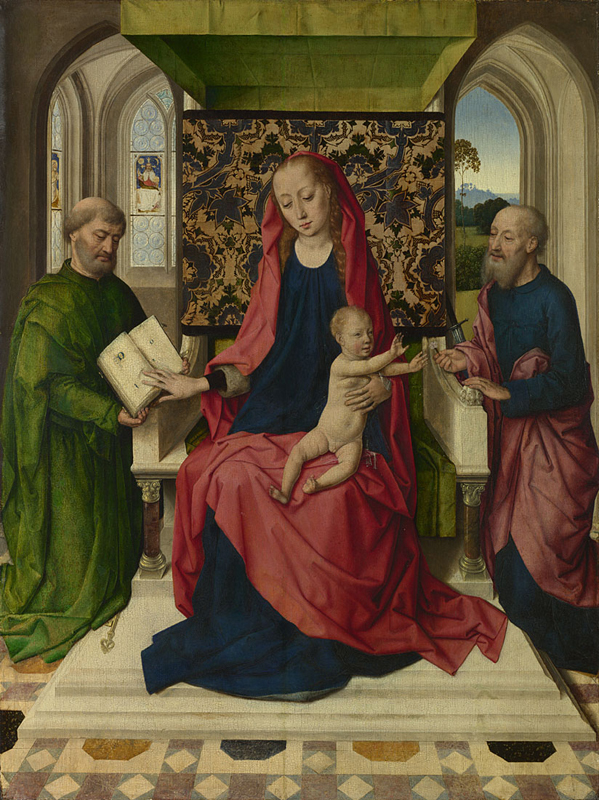 The Virgin and Child with Saint Peter and Saint Paul (c 1460s), an early oil painting from the workshop of Dirk Bouts in the Northern Renaissance, uses azurite rather than ultramarine for the Virgin’s blue bodice, and the red cloak uses vermilion. 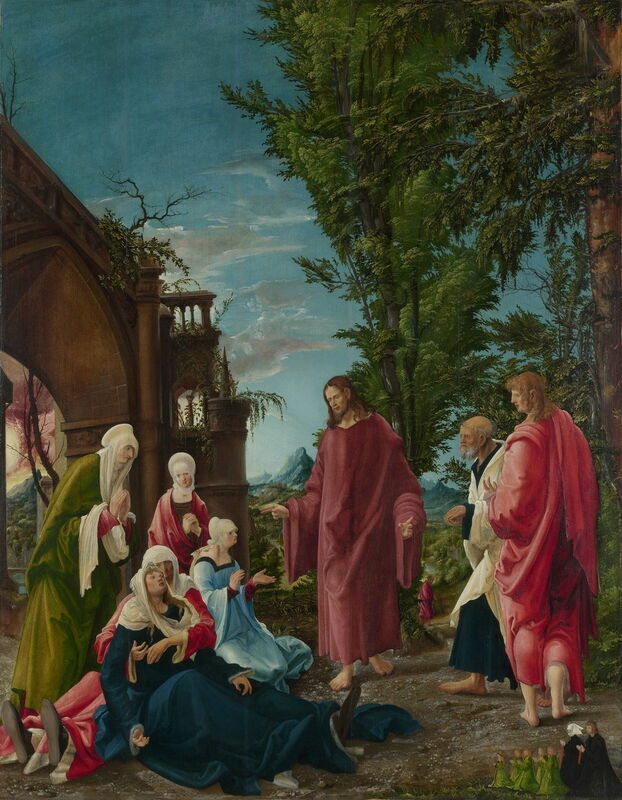 Albrecht Altdorfer (1480–1538), Christ taking leave of his Mother (c 1520), oil on lime, 141 x 111 cm, The National Gallery, London. Wikimedia Commons. Palette of 16 colours extracted from Albrecht Altdorfer, Christ taking leave of his Mother (c 1520). Albrecht Altdorfer’s Christ taking leave of his Mother (c 1520), again painted in oil, is remarkable in that all the blues – robes and sky – use natural azurite as their pigment. The pale yellow seen in the sky has been identified as lead-tin yellow, before it was replaced by lead antimonate yellow. Rembrandt Harmenszoon van Rijn (1606-69), Belshazzar’s Feast (c 1635-8), oil on canvas, 167.6 x 209.2 cm, The National Gallery, London. Courtesy of the National Gallery, via Wikimedia Commons. Palette of 16 colours extracted from Rembrandt, Belshazzar’s Feast (c 1635-8). 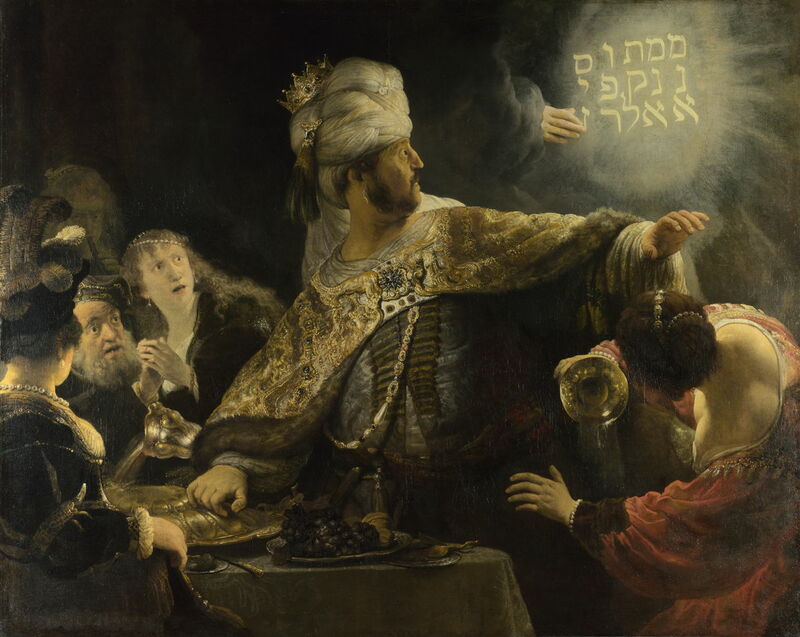 The blue-grey background in Rembrandt’s Belshazzar’s Feast (c 1635-8) has been found to contain smalt. 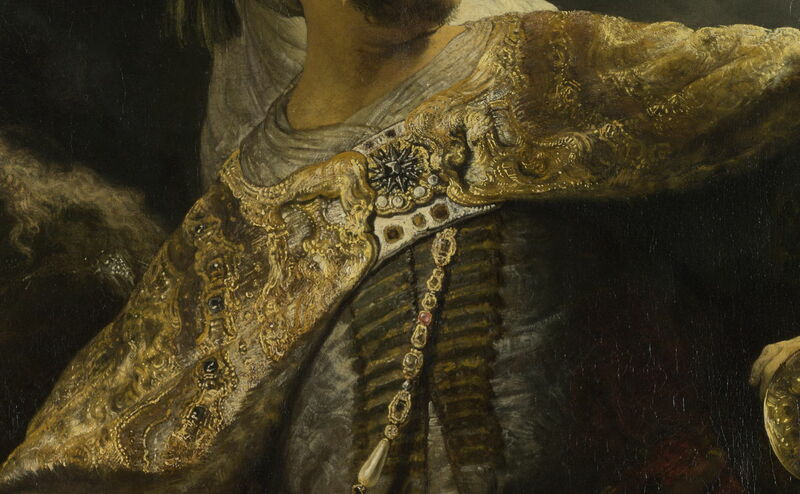 However, as this detail of the impasto work of Belshazzar’s cloak shows, Rembrandt also used lead-tin yellow applied quite thickly to the canvas. In his later paintings, he started to break with the tradition of applying paint smoothly, leaving visible signs of its application, a technique which was used by other painters at times, but which remained unpopular and often criticised until the nineteenth century. 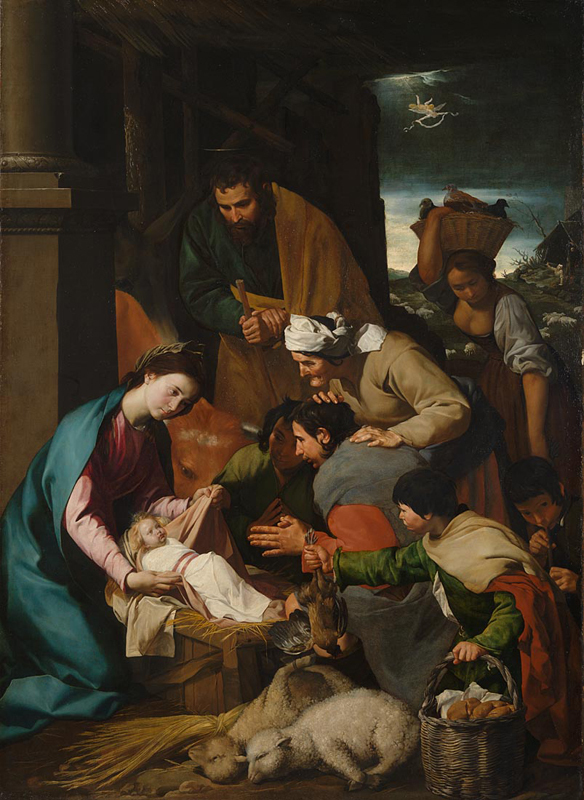 Anonymous (Italian, Neapolitan), The Adoration of the Shepherds (c 1630s), oil on canvas, 228 x 164.5 cm, The National Gallery, London. Courtesy of the National Gallery. Once ascribed to Murillo, the Italian/Neapolitan The Adoration of the Shepherds (c 1630s) is interesting for its use of smalt. The shepherd who is close to the middle of the painting, just to the right and below the centre, wears a dull blue jerkin, painted using smalt. This is believed to have become duller over time. Nicolas Poussin: lead antimonate yellow, yellow ochre, brown-pink (a dull orange), vermilion, light red, crimson lake, ultramarine blue, green earth, lead white, vine black, ivory black, lamp black. Example palettes during this period. The changes are summarised in the example palettes shown above. During and after the Renaissance, the range of pigments available to artists increased, and several of the newer pigments were high in hue. By 1700, there was a good range, although many tended to be dull, relatively low in hue and saturation, and best used in specific stages of painting, e.g. green earth for underpainting flesh. The great majority of pigments remained naturally-occurring minerals. Paints were generally applied thinly, avoiding any marks indicative of the making of a painting, but some individuals had started to apply paint more thickly, and leave brushmarks and other evidence of facture in their paintings. Posted in Painting and tagged azurite, chroma, earths, ground, lead-tin yellow, painting, palette, pigments, smalt, style, technique, ultramarine, vermilion. Bookmark the permalink.